How Does Creatine Help My Muscles Get Stronger? You are here: Home / Health and Fitness / How Does Creatine Help My Muscles Get Stronger? If you’re into bodybuilding, you’ve probably heard of creatine supplementation. This health and fitness trend is becoming increasingly popular among the gym set, and with good reason. Touting benefits like better strength, enhanced performance and more, creatine can be just the thing to help users break through a fitness plateau, build muscle, or kick-start an exercise regimen. Keep reading for more information on creatine supplementation, including its benefits, how it works, and how to get started. A substance made naturally by the human body, creatine promotes healthy muscle function by supplying the body with ATP, which is the fuel necessary to promote muscular contractions. Creatine supplementation works by providing the muscles with extra stores of ATP, allowing the muscles to work more effectively for an added amount of time. When it comes to building muscle, heavy weights at low repetitions are most effective; with creatine supplementation, users have the strength and energy necessary to lift heavier weights in a shorter amount of time, thus increasing the effectiveness of repetitions. Enhanced strength. Creatine use allows for higher reps with heavier weights, which, in turn, builds strength and muscle tone at a faster rate. Higher testosterone. Low testosterone, which is extremely common in men aged 30 and over, can result in decreased energy, poor athletic performance, mood swings, problems with concentration and other complications. However, regular creatine supplementation can provide a significant boost to testosterone levels, which can improve the aforementioned symptoms and enhance overall quality of life. Enhanced productivity. Creatine gives users more bang for their buck. By boosting intensity during workouts, creatine supplementation can result in more effective workouts, and in less time. This benefit is especially important for individuals who may not have hours to spend at the gym, as well as those who are training for an upcoming event or activity. Improved speed. Creatine has been shown to provide a boost in speed, especially during the first half of a workout. This is especially important for sprinters, but can be useful to other athletes as well. Better memory and concentration. By promoting enhanced neurological function, creatine can boost memory and reduce mental sluggishness. First and foremost, let’s get this out of the way. Creatine won’t be directly responsible for building muscle. Here’s why: It simply increases the amount of creatine phosphate you have in your muscle tissue which is a good thing for ATP replenishment. ATP has been known to be mainly responsible for muscle performance, so if ATP is replenished it will improve muscle function unlike when without creatine, ATP stores in the body will deplete quickly and will cause fatigue in our muscles. The idea is, while doing high intensity exercises which essentially are what’s needed in building muscle, we will have stronger and longer bursts of energy with creatine around to replenish those ATP stores. Which in turn will allow us to work harder and longer and that should lead to more muscle growth. At the end of the day when you have more power and strength due to constant ATP replenishments you will be able to lift more weight which as we talked about earlier is the stimulus that we provide our body to have a blue print as to how far it has to rebuild the broken down muscle used in the lifting, so it follows that if we are able to set a higher bar for our body to reach(bigger weights), bigger muscles will be built and bigger would mean stronger. Remember, creatine will not build the muscle, you have to use the extra strength and energy that creatine helped produce so you can lift bigger weights and do so at a longer period of time than without creatine. So you still need to work for it, but you’ll have a nice healthy nudge towards the right direction of stronger muscles. Choosing a formula. Creatine is available in both powder and capsule form. Both forms have their benefits, as capsules are more convenient while powder formulas may work faster. Cycling. Creatine is most effective when taken in cycles. Creatine cycles consist of a loading phase of approximately one week, a maintenance phase which lasts between two and four weeks, and then a five to eight week period without any creatine at all. After the five to eight week abstinence period, the cycle can begin again with the loading phase. Mixing creatine. 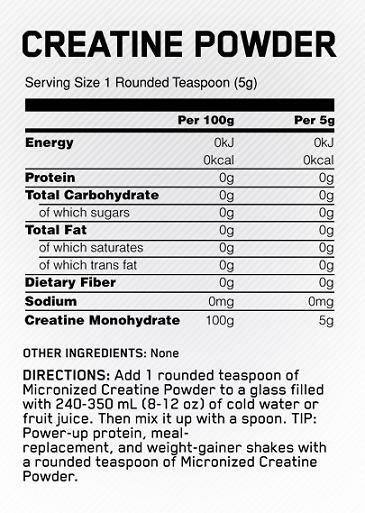 Creatine is typically mixed or consumed with carbohydrate-rich beverages like fruit juices and other sugary drinks. This increases effectiveness and helps speed up the process at which ATP is produced and stored in the muscles. Dosage times. If possible, take creatine at approximately the same time each day. Side effects. The most common side effect of creatine supplementation is headaches. In most cases, headaches are the result of dehydration, and can be prevented through sufficient water consumption. Be sure to drink plenty of water throughout the day, and sip water during workouts. This is just an introduction. For more bulking information, check out the ‘four common reasons why bulking diets fail‘ at Crazy Muscle. Then check out some other relevant sites and resources. Once you know more about creatine supplementation, you’ll be more informed to decide if this method is right for you. No matter which route you end up taking, remember to always work out with caution, have patience and enjoy your journey to better health and fitness.